Looks interesting enough at the initial teaser, they don't have 80 easy build kits though so who knows what will actually be the contents beyond the initial 4. "Issue 1 priced at £1.99, Issue 2 at £4.99 then £7.99 per issue thereafter." Could be the older push-fit boxes (Cultists, Guardians, etc.) - they're £6 direct. That still wouldn't make 80 issues, even with the Age of Sigmar and Fantasy pushfits, I don't think theres 80 collectively. At £7.99 I can see them giving out bigger sprues or heroes even. WD #1 had the Slaughterpriest, which has a RRP 18£. Primaris heroes are 20. Blight Hauler is 15. Issues could only include paints or tools. Thats my thinking too, Primaris combat squads are 20 pounds, lots of kits are around that price too and once the newsagents stop holding them on the shelves as they often do I would wager the deals will be better as they no longer have anyone picking up the one mag they want for discount on the kit. This could be great, it looks very much in the vein of the old LotR Battle Games In Middle Earth collection which I'm sure is the reason many of us are in the hobby to this day. Even if the value isn't as insane as it was with that (£3.99 a fortnight for the magazine and a full sprue of 10-12 minis or a metal mini and paint! Those were the days) then this certainly has massive potential to offer an affordable, accessible chunk of hobby material to people on limited budgets or unwilling/unable to collect a full army. Interested to see what kind of contents get served up, but I could actually see myself going for this; having a few minis every couple of weeks at a cut price to just muck about with would be good fun and not too straining on the wallet. Hey, they found something to do with all those citadel paint handles. You joke, but those things are never in stock at my local shop. Wait, what? At my shop, they're always sold out. As soon as they get a new delivery, everything is sold on the first weekend. It's by far the most popular item there. Shame it’s only in the Uk. I would happily buy the first issue. £1.99 for the easy build primaris marines, 3 paints and a brush is probably the best deal gw has ever done. Even the later issues are cheaper than just buying the minis. Very curious what they are going to put in the other 76 issues especially as it is weekly. Are there a whole lot more easy build kits on the way? Damm only UK... at least the two first issues are worth it just for the paint alone! Is there something about them I'm missing? I've seen them around here. Never tons of them, but they never really look like they have any missing either. It could be a regional thing. For example in Spain they are very popular, just like the GW tape measures. I know in many other places people just buy one much cheaper from a shop, but in Spain, to find a tape measure that it is on inches is very difficult, every single one is on centimeters. So like 90% of the people uses a GW official one. Cheap and handy. Other similar grips cost about the same, might as well buy a GW one. I actually couldn't recommend those things enough if you can get one. They're fantastic, and pretty damn cheap for GW tools. Ikea sells them with cm and inch for 1€. The paint handle is really nice, actually. As for how they are going to get 80 issues, I don't see anywhere that says there will never be duplicate miniatures. I'm sure at some point they will have you build bigger units. I'm not sure it will be worth it for someone who has a 40k collection / many of GW's E2B sprues but as a way to introduce the hobby to more people this is a good concept. I like it but wouldn't probably subscribe. Hopefully - like the Star Wars and Marvel comic collections - this will be available in other countries too next year or so. I guess the paint pots are the smaller ones, from the Marine/Death Guard paint sets released last fall. Looks good. Do they also deliver to continental Europe? This may be Hachette doing a trial run again. They ran it with the 40k novel run, and the Transformers comic run. I know because I signed up to both. Rather than a ‘will this actually sell’, it’s more ‘what sort of volumes should we print’. When 2000ad and Dredd went live, it was U.K., Europe and Australia. I subscribed for the first 4. Seems like something fun to go along with and if it loses steam after the first 4 I'm out £23 or so tops. I have signed up for the first 4 issue trial run and will grab couple more issues of 1 and a second copy of issue 2 if I see any at the shops. At worst I get a couple of paints I will have limited use for and some models I don’t already own to paint. My local has 8 on the shelf right now. Are they usually hard to come by? What would be the point? The international shipping would wipe out any discount, I should think. So is this on sale in places like smiths then guys. Would grab a couple at 2 quid a pop but now the snow has hit big time around here, that’s put the kibosh on getting in to town for a bit. I wouldn’t expect to see it in the shops for a couple of weeks, Hatchett partwork websites tend to go up at least a few weeks before hitting shops. BGIME had the odd exclusive figure now and again (Boromir in armour, without the standard and Hama of the Rohan Guard I think). It was also one of the options put forward in the survey that I mentioned earlier. Once the part works is up and running, the web site will normally have back issues available for those who want to be more selective over what they purchase. I've subscribed - worth it at least for the first month, depends what comes next when/if I cancel. Looks like a great tool to get kids into the hobby and build up their collections. Some kits they can split over two issues like the EZ build redemptor, and I would put money on the Chaos cultist sprue turning up in the first few months. I'll probably subscribe for cheap minis plus paints. Some of the LOTR issues were really good. It would also be great if scenery were included. The new ruin sprue is pretty easy to put together for a start. I hope it doesn’t come out for a few weeks, I go on holiday tomorrow and I’m not back till the 15th. I want to pick up issue 1, a couple of times if they aren’t shifting. CoOp and Smiths are usually the ones. To the post about shipping from UK not being worth it, it may wipe out most if not all of the discount for the models and paint, but you are getting the magazine which is quite an interesting thing for some. (Also, that’d ship to the US for what maybe £10? Might even get 8 issues sent for that cost spending what’s in it. that's why, 4 at a time. And because it's cool! Hama (issue #53 exclusive), the other Hama (Hornburg) pose was released individually as well as in Defenders of Rohan set. Gandalf the White on Foot (not standing on a rock) with staff raised was a issue #39 exclusive. But not even out £23, as you’ll have got the RRP £20 Of models from the box set, a £3-4 brush, 6 paints at £15ish, plus the 4 magazines that may be alright. Decent saving..
Also month 2 is only £24 as you get the free issue, so it’s all to play for with what’s in those (of course we will find out when they turn up in a bundle I suppose so may or may not be worth it. I had a thought if they aren’t doing part models per issue and it’s a whole model at least every time (their wording suggests), Felthius - one week, then the Cohort the next, as you’d get full sprue each time, is there anything primaris that is similar? A whole dread in one go would be great. I also think after the first 4, there isn’t no need to go easy to build stuff either, as you’ve had 4 issues to become a modeller, so it could just be anything, that old one Marine on sprue bit, the set of three models that come in each of the paint sets, there’s like an ork one and so on right? Could even be a sprue of something they are re doing later in the year, just to clear them, old finecast models even. I’m definitely keeping an eye, will be interesting to see where it goes, and if they make it to 80..
Back in the LotR days they did the odd two-issue set, typically cavalry where you'd get the mounts one issue and the riders the next (though as they delivered 2 issues at a time you got it all in one go if you were subscribed). So doing a Dreadnought over a couple of weeks is certainly possible. I'd not be surprised to see a few of the more recent character sprues make their way into future issues, they're hardly the most complex models in most cases. I worked at the distributing warehouse for the LotRs one. For reasons I can’t explain I never hoarded all the returns, just skipped them with all the other month old mags. If (and let's not kid ourselves 'when' ) they release this in the US, I'm all over it! I've looked at a lot of miniature subscription services, and they all seem very unappealing (would be happy to be proven wrong ). But I would enjoy receiving a somewhat rando mini from GW, especially every WEEK. Seems like they'd really have to step up their mailing opperation for something like this, but, if it works, you'll seed people's collections with a lot of minis they might not have normally purchased. Hopefully it does well in the UK, so we can get it set up in other countries as well. Yeah quite a lot of those character minis were single sprue set ups, so really easy to do them. The Multi week Dread thing goes against the website as it does say “Each Issue” has a miniature, LotR never promised that. I know by 5 issues in no one will be doing it (as people will be subscribed by then) - but technically it is possible to buy the issues one a time a time. So sticking by their words they can’t do it, but I could easily see that being the way it’s done. I think the first few months will focus on Imperium and Chaos. Primaris and Deathguard have 4 EZ build kits each. However there is no reason not to put sprues from the starter sets, the single character sprues or the 5 man primaris sprues in there. Deathguard have a lot of elite characters. However Lord Felthius is almost certainly going to be accompanied by a primaris captain of some sort for balance purposes. What I hope they do is introduce a low point game standard format and missions. Kill team is sorely missed. They could then do a Kill Team box based around EZ build kits or similar. What I might do is a collect along vlog were I build a new force based on the magazine. You could also find Marine sprues being repeated, especially if the paint of the week is for Blood Angels. The other thing BGiME did was to include cut out cardboard models every now and then dependant on the scenario, for example Watcher tentacles. There was also bonus sticker sheets as well. The best I remember was the large Royal standards for hanging around a scratch built Theoden's Hall. There was also two special issues for Two Towers and ROTK that, for a higher cover price contained the metal mounted Gandalf/ Shadow fax and King Aragon models. Easy build Dreadnought as a special outside the numbered releases for a higher price? I guess we'll just have to wait for whatever is planned past the first four issues. Don't forget that the survey also hints there could be be more available if a subscriber is willing to pay extra per issue. The extra money per issue could definitely be where we get a Dread and such. And repeat models particularly on the SM side will happen I’m sure (much more noticeable on the DG side as their marines look more unique). Having read the questions but not completed it I would say the survey is looking for feedback on what the later issues feature. I'll be saying small scale skirmish rules like kill team, scenarios, exclusive models and big models. Honestly after seeing who is behind it and the fun times I had dealing with them (hachette), any interest was immediately killed with prejudice. My experience with Hachette hasn’t been too bad apart from the fact that they are sending out hardback graphic novels in rubbish cardboard boxes that sees the books end up damage every other month. That said, they always replace ant damaged issues without any question what so ever. When I have cancelled previously subscriptions it has always been very easy to do and just needed to send an email. I don’t think the packaging will be an issue this time around. I remember the "packaging". Cardboard box 3 times the size of the book, book is loose with no padding. As for cancelling, it took several weeks with phonecalls and emails daily. Every time it was "Ok we've cancelled it, it'll show up in your account tomorrow", but it never did. And they went right on sending more stuff during that period. They only actually cancelled it after I had the bank put in an order to refuse all payments to them. Shockingly they were actually able to cancel my sub almost immediately after I told them about that. I did get the money back, via cheque, for the stuff they sent me while they knew I was trying to cancel. They seem to alternate packaging between massive parcel way too big for the book with no extra padding so that it gets damaged or exactly the right sized box but waffer thin cardboard so offers no protection at all. Not ideal with hardcover books. Annoyingly they did trial some really good cardboard boxes that were a perfect fit but had extra cardboard around the corners to protect the spots most ofrten damaged, unfortunately it was only used for a few months. Hopefully Conquest will be in a larger box with extra filling. Shame it was such a pain to cancel, for me it only took an email and had a reply with 12 hours confirming both subscriptions were cancelled. I am hearing that the magazine is now listed in the W H Smiths database and could come as early as Tuesday. Counter-anecdote; I cancelled my subscription to the legends collection thing on the hatchette website and it processed immediately, I had no further deliveries and no further money was taken. Maybe it was after MrDwhitey's trouble and they made an effort to sort their act out, or maybe it was before and they've gotten worse since, but either way my experience was fine. It's dakka and no one has ever had anything go right for them, so don't worry about anecdotes. I plan on unboxing these on my channel and doing build along and paint along and hopefully play along when I sort my workshop out in the next two months. It'll be interesting to do a project with a definite beginning, middle and end. I plan on doing the big boy marines as Lamenters and the Deathguard as classic Deathguard rather than my existing scheme that is much closer to heresy era. Well I had a subscription reply saying how they’ll be taking payment and how issues will arrive etc. you get a subscriber number and such. Just under 400 for me so decent number of people seem interested so far considering it isn't even available in shops or advertised yet. Hachette always increase the number of issues if a product sells well so I wouldn't be surprised to see this go up to 120ish. My sub number is 760 and I subbed a couple of days ago. Anyone seen any marketing start up for this yet? Only really had one issue with their postal - and I think that was more due to the doofus Postie leaving it in the rain. Other than deliveries with things like the bookends, all my Dredd and 2000ad issues came in packaging akin to that used by Amazon. I like to keep two or three knocking about, as they're quite useful for posting books out to others. If anyone sees it in shops in the coming days, let me know! So, i was initially interested... Then i realised what else i could be doing with the £630... Namely buying the models i want with plenty left over. Can't say that these are not popular. They're not very expensive, so I've seen people ordering 10 of them so they could batch-paint with them without changing the minis all the time. I bought one and like it, I'm getting more as well. Was all excited when a big box from Hachette was on my door step when I got home from work as thought they had delivered in record time. Unfortunately it was just 2 issues of the 2000AD hardcover collection with replacement mug. I this going on sale at WH Smiths? Yes, but don't know when. It will be soon though. Someone mentioned on another site that it was added to the WH Smith database on Monday but didn’t have a release date. And once someone does get it ordered, or sees it in store. My local Sainsbury’s and WH Smith’s only received the new WD yesterday. Seems to have been delayed by last weeks weather. Cheers chap, will head over tomorrow! Bah, UK only. Hopefully if this is a success they will extend it to other countries. I've justed called to cancel my subscription before anything arrived. I emailed several times about the paint pot sizes and had no answer and when I called up the guy said they're the smaller tester pots as I thought they probably where. I hope I'm wrong for anyone who is getting the magazine, please share when you received it. The paints are the usual 12ml pots, not the small ones, there's about 20 pounds worth of GW stuff in the first issue. Interested to read about the colour codings etc. Makes sense really. I do note that my 2000ad issues are late this month. Again, probably due to the poor weather the other week. I think that this may still be on a trial release as those who have picked up copies appear to be in the north east (Yorkshire is key area for these trial releases). This would explain why they have the survey on the website as well asking if you would pay extra each month for terrain, etc. Those who have signed up on the website should receive the first 4 issues still and hopefully enough interest is generated to call the trial a success and roll out the full release (may be a gap between isssue 4 and 5 those for subscribers). If this is rolled out to a full release then it will start to pop up in every shop at that time. I've been dropping into WH Smith's in and around London when I pass one. Nothing in those so either people are snapping up the few copies that come in quickly or it is a limited geographical release for now. Sounds like this is a limited release then which isn’t unusual. I have been trying in Smiths and several news agents in the south east and no look at all. When does this land then? I must admit I took a sub and have no idea when the first delivery will be? Has anyone got any further with getting hold of this? I've ordered, but nothing so far. Trying smiths everyday in derby , nothing yet. Sooo, this has nothing to do with the FFG card game? Customer service email doesn't work for me. I accidentally listed my Mastercard as a Visa and now I guess I'll have to call them to tell them. IKEA link? I can't find them. NVM... just realized you're talking about measuring tapes and not paint handles. Every dollar store in the US has tape measures for a buck. I picked up two of issue 1 and one of issue 2 in whs York yesterday. They were the last 2 of issue 1 but they had loads of 2. I can confirm the paint is full sized pots and the brush is the normal citadel one. Still nothing down south, hopefully they do appear next week like suggested above. If it’s available up north only, pretty much confirms we’re in the trial phase. Yeah, I suspect trial phase as only reports from Yorkshire area (key trial area) but someone mentioned the main UK wide launch is next Tuesday. Seems a bit soon to me but still holding out hope. I've not been able to find them anywhere on the shelves in Leeds. I emailed asking if they knew any stockists, but have had no reply. I saw some reports from York and thought I'd missed the boat. Fingers crossed I haven't. Doesn’t seem like anyone has had replies to emails really. I guess calling is the way to get answers. I had a reply to an email I sent after the website crashed halfway through my first attempt at signing up. In Harrogate today and they have lots of issue 2. Sold out of issue 1. The website links to a survey still which I think would have been removed if they were ready for full rollout. As issue 2 has only just been released in Yorkshire I expect 2 more weeks of test issues with issue 4 being the final issue released. They will then review the sales and survey responses before deciding how (and if) to proceed later in the year. I wouldn’t expect to see it officially launched before May. Those who have signed up on the website should get the four trial issues as well. The 20th release date was posted above and came from someone else on Facebook. I wonder if they have just been misinformed by the local shop and that’s actually when trial issue 3 is released. All of Yorkshire? Or just North Yorkshire (I've seen York and Harrogate mentioned). Maybe I was just slow for the Leeds copies, but I haven't seen it anywhere. That is exactly my problem. I've just started working again but £32 a month is a bit too far just for the odd paint or mini I might use. I literally might just see what individual ones come with what. I haven't seen it in Sheffield yet, but I'll be checking WH Smiths tomorrow for it. Checked the main WH Smiths in town - no sign of it with the part works or the wargaming magazines. As someone mentioned, it might just be being trialled in North Yorkshire, rather than the whole of God's Own County. Just looked on the WHSmith retailer app.. and its not there yet, so severely doubt a Tues countrywide launch, usually up for preorder a week or two before.. going to ring them on Monday and ask again, but the agent I spoke to on Thurs couldn't find it, but did recall a message about it, just not what the message entailed.. I'm guessing the preview launch. They did the same thing with their Black Library book collection. I will check tomorrow as it’s the 20th, but it seems not as no one has it listed..
My subscription email only stated that first delivery would be within 28 days so no indication there of when the retail release could be. Guess they really want everyone to subscribe and not bother shipping to retailers. Haven't seen this anywhere yet. Not to worry, I just wanted to scab the cheap early issues, no interest in a pot luck ongoing. Sad for those who might want it though but won't get to try it cheap before committing. I'm sure there will be a general retail release across the UK. I think a trial release plus offering a sub early will allow the makers to judge how many issues they'll need for ongoing sales. If enough people are into it for the full 80 issues, others will be able to benefit from the back issue sales that tend to accompany a store website so they can pick and choose. Just check the Hachette and Eaglemoss websites. All of the graphic novels are in there. Wait long enough and you could even get a sale price! I'll check my local Tesco when I go shopping later, I'll report back tonight, not holding my breath. I don't even know why I'm excited for this, I mean it's a few easy build marines, and I don't even like marines... but I'm sitting here going "There has to be an update today! Come on!!!". The relative excitement of not knowing what you are going to receive. If it's like Battle Games in Middle Earth, some issues could be scenario based. Pure conjecture but something like issue 20 coming with the sprue of easy build Cadians and the scenario being that your Intercessors have to rescue them from the Death Guard. I'm relatively comfortable with 32 quid every month for a couple of months at least. As the issues go on, they could start introducing the different types of brush for GW's paint system. Will check again in Sheffield on Saturday. Nothing to be seen in south Manchester so far. Keeping my eyes peeled! The local GW manager said today it's likely it'll run it's full trial period in North Yorkshire before a nationwide release. He also said GW stores wouldn't be carrying the publication. Has the 3rd issue come out in North Yorkshire yet? Spoke to a guy in WHSmiths, he was aware of it but said when he had queried it it's Northern area only and whilst it should be on the toll system it's not expected to be stocked outside of that area at this time. I've just realised that I got my "28 days" email March 4th. Did anyone who subbed actually get anything? As despite subbing pretty quick and getting a confirmation email I have got nothing. When I have been in trials before they usually only send the web orders after all 4 test issues have been released in stores. I know that 2 has been available for a few weeks but seen any confirmation on issue 3 being available yet. Thank you for subscribing to Warhammer 40,000: Conquest. We would like to inform you that we have paused the publication of this title but we are hoping to launch the collection nationally in the near future. We will be sure to keep you informed of any developments via email, and if we do launch the collection nationally we will send you the first 3 issues of the collection for free as a thank you for supporting Warhammer 40,000: Conquest from the beginning. Please rest assured that your account has not been charged at all. If you’d like any more information please contact us via one of the methods above. Exactly the same email for me. Disappointing, but nothing charged. Yep just got the same email, looks like their super limited releqase to one or two places in Yorkshire didn't generate the intreste they wanted. Ah, bummer, I just got the email. That's a shame. "We really want to test this, as we think people based in populated cities will love this. Where should we release it?" "I dunno, which place has the least amount of people in, that has no real interest in this hobby?" To me it sounds like it did generate enough interest and will now be released nationwide. They just are not bothering to send the trial issues to internet subscribers but will instead send them 3 issues for free when it does launch properly later in the year. They always tend to release trials in the north east as it’s a tough market and if they do well there then they should do well nationwide. This is pretty much word for word the email they sent to people for the Transformers Ultimate Generation 1 Collection series they published, which was released nationally shortly after a similar four issue trial for what it's worth. Well, I'm looking forward to my three free issues in any case should a full release happen. Hopefully the delay won’t be too long and it will be easy for those who have already signed up to upgrade to a premium subscription if they offer one (the question and answer system says that they may offer subscription option where pay £1 extra an issue but get sent larger models or scenery every so often). Yeah I just got the same email; a big ‘if’ in there....hopefully this roles out either soon or long enough that I have forgotten and get a cool surprise package in the post. I’m guessing this down to demand or the title being “Conquest” and there being some copyright issue. 3 issues free is a nice touch but I would have preferred the full price ones for free, still we’ll see if that happens! As expected, I've had the same mail. I'm not holding my breath on this one. I really hope it does come out though. When I realised that the delivery window closed on April Fool's Day, I knew something was going to stop it arriving. This was always a trial release and never going to make it passed issue 4 (surprised they stopped at 3 to be honest as they advertised all four and that would have completed the intro boxset). Sounds like there was a lot of demand which is why they are planning to launch the full title in the near future and can’t see Conquest being an issue at all. Definitely not a copyright issue in my opinion, it’s not like they planned all this without GW knowing the situation and such. It is a classic Hachette thing to pause and relaunch. So demand is the one I think. 3 issues and there’s already a free issue for subscribing (which curiously said your second delivery, but then everywhere else was saying issue 3. So I wonder if we would just get all four for free). Cool surprise for me I think unless they email before sending (I’d imagine they won’t as they want people to stick with it an email might make you think oh yeah this, I’ll cancel). Now I’ll stop browsing forums for info on it and just forget about it. Of course I obviously also meant licensing when I typed copyright. Fantasy Flight Games lost the licence for Warhammer Games last year or maybe the year before so the Conquest card game was cancelled then. All rights to use the Warhammer 40k Conquest name would have reverted to Games Workshop. A license does not normally/necessarily pass ownership of developed product/IP to the Licensor. All that definitely happens at the end of a license is that the licensee has to cease use of said license. This new product most likely couldn’t use any of the rules developed by Fantasy Flight (which it wouldn’t do as that is a card game) but Games Workshop are fully entitled to reuse the name. GW aren’t stupid anyway, they wouldn’t let Hachette choose that name and print several copies of the magazine if they weren’t sure it could be used (I wouldn’t be surprised if they chose the name for them - and to fully take that name back as it were). It means they sold enough in the toughest market in the UK to go national, likely in May. Bear in mind there's been no TV advertising or indeed any advertising at all and they still picked up a large number of subscribers. So there is someone at GW frantically writing more issues. An interesting picture from the back of issue 4. If issue 5 ever appears you will get a new space marine hero. I doubt it is exclusive so it begs the question of when it will see general release. I really hope this goes world wide. I would definitely get a subscription. I doubt it ever will though. Interesting that they are introducing new character models so soon rather than reusing some of the existing ones but a good way to get regular players to pick up certain issues if these models remain exclusive to the magazine for at least a few months. Is that one of the models from the Japanese Heroes series? Nope. Unless it’s the limited edition captain which I haven’t seen a picture off but I don’t believe it is. It is not. The heroes series is all old school marines. This is a primaris. It could be from series two which we haven't seen yet, but the hint suggested old school terminators. I have found a photo of the Japanese captain, definitely not that model either. The trouble with the Japanese collection is that they are slightly bigger than a regular marine but significantly smaller than the Primaris marines from issues 1 and 3. I think they will want to be consistent with the marine size for the moment at least. Looks like the Ultramarine equivalent of Tolmaron and Zakariah. Hoping they will eventually publish this outside of the UK as well - a 40k version of BGiME, oh yeah! I don't suppose anyone has heard anything more on this? Beginning to think it may be dead in the water. Several months between trial and full release is the norm. I wouldn’t be surprised if we don’t see anything until July or August (or even later). Ah cool, cheers. I've never bought their publications before so wasn't sure. The gap with the book series one was 3 months I thought. So June/ July should be about right. Unsure if anyone else has picked up on this but Chapter Master Valrak is suggesting it may have been cancelled - just a head's up. The company that can maintain a global supply chain of their goods. Quantity was always my concern with this especially for the first couple of issues where they order a huge amount for a discounted amount. Where are people getting the rumours from here? That one was from a couple of people at a FLGS (one of which was a staff member, FWIW). They claimed that GW's production capacity was still maxed out (look at how much stuff is still "Temporarily out of stock") and they hadn't accounted for how much stock Hachette actually wanted. IF that is the case, could it be the supply of paints that would cause more of a problem. Some of those who managed to get a trial issue stated it was the full size pots as per the publicity photos. Anyhoo, if there is normally a couple of months between trial and the main run, there would be some lead in time to produce more figures/ paints. I'm still looking forward to it especially if, as per the preview for issue 5, you could end up with character figures for £7.99. Just sounds like hearsay. If the demand was that big I expect they'd be even more likely to go ahead, not less. Would be disappointing if it doesn’t go ahead as it’s a great way to get new people into the hobby and I enjoy the graphic novel partworks so a gaming partworks also appeals to me. I don’t know how a staff member in an FLGS would know anything about this. It’s not even the target store - rather WHSmiths and newsagents. The website said all along what was going to be provided in the magazines. Just imagine if GW ‘didn’t know’ what was expected of them. There will have been huge discussions between the two companies before undertaking the print and packaging of the trial, let alone the whole thing. I imagine they get the first x issues created and ready, so that there's no delays, and then while they are sending out the first month or so's issues, they can be creating the next batch. in Japan. The series launches globally later this year along with series 2 in Japan. That ties in nicely with the UK Forbidden Planet site listing the start date as 1st September! Nice. Cool to see Space Marine Heroes is getting a worldwide release as well. May actually be able to sign up for the complete run, seeing as my Dredd Megacollection has just one more issue to go! Also noted in the BBC article ( https://www.bbc.co.uk/news/uk-england-nottinghamshire-45019803 ) they’re focusing on increasing production capacity. So just for clarification. The marine heroes are getting a world-wide release, the conquest partworks isn't? That Middle Earth partwork from '02 was my initial steps into this hobby. It was great value for money and was great in general for a newbie. I'd be interested in picking up this one too just for the hell of it if it were available. This is good news, I thought this had gone to the wall. But, Hachette have previously made stuff available in U.K., EU and Australia/New Zealand. Not sure what the criteria is for such a release, but at least it seems possible. Pleased I signed up for this early as I received an email saying my first 3 issues would be free for being a supporter. I’ve ordered a couple of extra first issues as well because who can’t use marines, black paint and an extra brush, eh? However, I’m a bit puzzled what will be included in future issues. I have presumed it will be models each time but they will rapidly run out of easy build ones. Aggressors? A redemptor split over multiple issues? A blight hauler? Then what? Do you think they have more easy build models in the works? Will they start putting bits of terrain on the cover instead? Will the serialized 40k thing be UK only or will it include the USA? When it was first trialled it was listed as UK only. Not sure if that has changed. Would be nice if it did and would help them spread the cost of developing new easy build models. I think we'll see some new models. 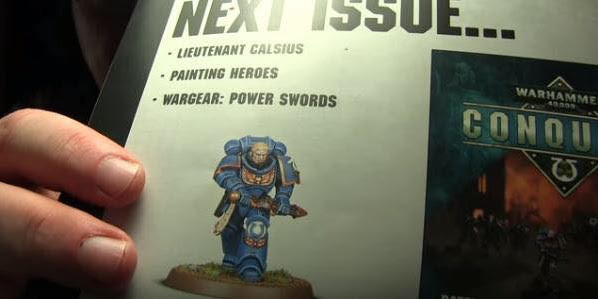 The preview for the unreleased Issue 5 had a Primaries Ultramarine Lieutenant an (as yet) unreleased model. Oooooh. I hope they don’t go too far down the Ultramarine route. Generic marines are probably a bit more flexible. It will almost certainly be UK only. Heck, Hatchette doesn't even have an American arm IIRC. Has anyone heard anything about this launching? I thought it might have been available by now? Rumours seem to point to September. If it is a 1st September release I expect those us who signed up for this should get a mail in a week or two telling us it's happening. Order systems have issue one logged as September 1st. Will there be any way to order individual issues of this online without having to deal with sclaperscum on ebay? I've no interest in subscribing for a bunch of models I won't use and what you assume will be sub-WD beginner level painting tips, but if they're going to put out unique new models through this it'll be annoying if there's no legit way to get hold of them. The Dredd, 2000AD and Black Library collections are available individually, sometimes at a sale price! Check the Hachette website to see if magazine partworks are available as individual back issues. I've just ordered some extra issues from Forbidden Planet. They might deliver to Europe, otherwise myself or one of the other Brits could potentially organise something if they come out with something killer. Ah so even several issues in if there’s a good issue with a model and a paint I want, then Forbidden Planet I can just grab it as it’s out? I was worrying it’d be a subscribe if you want stuff and no longer in shops after 4 or 5, like a lot of partworks. Have FP always done that? GW Stores are pimping it on their FB pages as of now. If like others you’re mainly interested in the Exclusives, rather than the whole set, you’ll want the link just above to see what’s coming ‘next issue’, and then Hachette’s main website to order singles and/or back issues. We are delighted to let you know that on the 29th of August Warhammer 40,000: Conquest will be launching nationally! As a valued test subscriber, we will be re-activating your subscription from issue 1 and will be sending you the first 3 issues free of charge. This means that you don't need to subscribe again once the new website is live. Waiting for details of if they have a premium subscription, and if so, what benefits this has (they mentioned possibilities of terrain or exclusive models in the questionnaire). Yep, just received that as well. Looks like it is finally happening. Got the e-mail as well, not sure if I'm going to stick with it long term (as I already have two ongoing partwork subs and there are another couple of them probably starting soon that also look interesting), but figure I'll at least get the 3 free issues and see what the mag is like before deciding. At least this is one where even if you cancel part way through the stuff you get is still useful, unlike the ones where you build something over so many issues. Will be interested to see if the paints are still the full paint pots or whether that was just for the trial run to avoid the need to have to make up special batches of paint in a different pot, as that definitely helps towards the value. I got my mail as well. I won't be pleased if the paints end up as the 3ml mini pots after signing up with them advertising full sized pots. I assume they'll start to re-advertise the product. If things have changed from the trial run, we'll see it then. Enough time to cancel if we're not happy. Got my Email saying I'll have 3 free issues starting 29th. I'm unreasonably pleased by this good news, i don't often get free stuff (that I actually want) I can't wait! Yeah happy with the free issues, and the ability to seemingly buy single issues down the road if I cancel (depends what further issues have - no need for Primaris, I do have Deathguard but the models so far are repeats for me. Will take them anyway though ☺️). This has been on the pre-order system available for retailers for 3-4 weeks now, this is just the announcement to the consumers that it will be available.
" Over the course of the series, subscribers will receive all of the models, tools, paints and paintbrushes you require to create two sizeable armies – Space Marines and Death Guard – that are ready to take to the battlefields of the 41st Millennium. " Issue 5 is supposed to come with a Primaris LT. Presumably 6 will be a DG equivalent. Fairly cheap way to bag some ‘spare’ Kill Teams as well. Definitely an idea with the Primaris to do a new Kill Team Chapter Of marines. Originally I was just thinking of painting up a marine from every chapter I’ve always thought of doing. I'm pretty intrigued! The old lord of the rings magazine really got me into the hobby back in the day, I'll at least do the first month to get the free stuff, and I need a bit of reinforcements for my armies anyway. Looks like it contains everything from Dark Imperium but I wonder how they'll do the tanks and bigger things. Maybe over 4 mags since you get 4 at once(says they're delivered once a month)? I spy the stupid price Primaris Characters. As single sprues, you’ll be able to get them for a mere £7.99 now! They have added details of the premium upgrade as well now, it’s more game related components and boards rather than models or scenery. I work at smiths. Its on the system as "warhammer 40000 partwork" and the trial run was on under "warhammer 40000 partwork test". Ask them to do a product search for warhammer and it'll come up. One sprue per week for the hover tank? BGiME used to spread cavalry over two issues. Horses one week, riders the next. I'll quite happily take the Primaris Apothecary for less than GW retail. Some of the 'free gifts' have changed as well. Brush set instead of an art book for example. Balthazar Gold paint has been replaced with Retributor Armour on the new site. So if I just wanted, say, the Spawn, could I order the "Spawn" issue? I don't know if you can order it like that from the website as they take payments monthly the ship 4 at once. I presume you'll be able to pick these up in book stores or wherever people usually get these subscription mags though right? So...I pay £1.50 extra per issue in order to get some undefined non-model related reward from Issues 15-18? Meaning I'm actually paying about £25 for it? That's terribly vague and potentially ill-priced. You can order single issues from one of the Forbidden Planet brands and they ship internationally. The forbiddenplanet.com company have the issues rather than the alternate .co.uk company. Allows for me to order back issues. But I’d expect the best value (£22.50 Chaplain for £8) to sell out quickly? Yep! It’s a recent thing they started to offer in last couple of years, often it’s additional large books or art prints however the contents are advertised in advance. This is so nondescript that they could offer extra models / terrain or it could just be some cards and a cheap folding mat which you wouldn’t pay £5 for usually. I much prefer the other option they sometimes offer instead where they offer them as special issues every so often and you decide at the time if you want them or not rather than commit at the outset. Looks like it's still the full size paint pots then, or at least, they're still showing them on the website (annoyingly, I need to pick up a pot of Macragge Blue for a project I want to work on next week, but will get a pot when my free issues turn up). Haven't tried to work out how the price stacks up, but the total cost of approx. £624 (I think) doesn't sound a bad price for the volume of stuff shown in the image. Not sure about the premium subscription, though I'm guessing what's in the picture is just one of the four sets that you get, so maybe worth the £30 it costs for that. That's cool. But I don't care much for out-of-scale Marines. I'm weird, I want the less desirable stuff - the spawn, the battlefield accessory set, and, yes, obviously, the terrain. That plague mortar tank would be cool though. Ain't got any of them in my DG army. I guess the Plaguedrone thingy or whatever it's called would be the E-Z-2-Bild one, and not a proper kit? And lo, I see all that scenery and wish I could get in on this in the US. I’m wondering if the Plaguemortar and other substantial kits will be released over consecutive weeks, or more spaced out? I'd imagine that some of the more sprue-intensive kits (the Mechanicus terrain, the plague mortar, the silly floating tank with too many guns) would be across multiple issues. I mean, that one Sector Mechanicus piece they've got there is 3 sprues. An single Munitorum crate is 1 sprue, and there are three of them there. They have to be spread out. But will they be consecutive issues, or dotted throughout the release schedule? Guess I’ll find out, as I’ve subscribed. So did some number crunching. drawing sword from scabbard guy?? Were this available to us Aussies, i'd be a fair bargain! To buy all these kits individually (and assuming it's the easy-2-build kits for some of the primaris guys), Total cost of minis bought individually = $2349AUD approx. This is also assuming there wont be some arbitrary Australia tax applied. All that doesn't take into account the freebies + paints you get. Which wont tack on a huge cost, but aren't cheap in their own rights. Two full armies and terrain for not quite half price. Even if you weren't interested in one or the other armies, that's hard to pass up. If this comes down under, I'll certainly be signing up. Thats the thing, I love the look of this and I signed up originally so I'll have the 3 issues for free, but do I need this? I've already got the primaris side of Dark Imperium unbuilt. So I'll end up with double that, plus the extras. It's interesting that cultists and spawn are in, that will be fun, I've never picked up the spawn kits. I have some cultists, but not done much with them. I wonder if they'll provide a pot of paint or two each week as well? This could turn out to be incredible value. I've already ordered enough issues 1 extras that I'll probably never need another pot of Abaddon Black. I imagine the paints will gradually disappear as the release goes on and people have all the paints they need, probably as the larger sprues start being included. Maybe with the occasional additional paint being included to tie in with the more advanced techniques as they appear in the painting guide, I seem to remember that was the case with BGIME. This is still UK only right? WarCom said initially UK only, with a view to a wider release. I've just gone for the standard subscription, don't fancy those extra bits with the premium. I'll be keeping the primaris/marines and the terrain, but selling the Death Guard parts on to a chap in my local gaming group. Still, decent value with paint and extra bits! I am impressed by the complete collection, I already have a sizeable Death Guard collection but will gladly add bits from the Vanilla marines to my Deathwatch and make a home brew chapter for the bits that do not fit in. £32 odd a month is a reasonable investment for a bit of hobby joy every month. Reckon we’ll see an AoS version in about a years time. May be an affordable way to get a Black Coach! I was thinking they’d probably do AoS later down the line, maybe come back with another Middle Earth as that’s being relaunched as a game too.. It is good to see that full picture, to know where we are heading as before it was so unclear it could have been anything. I think you can split that picture into 80 pretty much. The deluxe version, really would depend on what’s in those other boxes, as the first doesn’t install excitement. As long as the ‘big picture’ is what we get in the standard, not deluxe, then I’m fine. I agree the paints will probably fall off down the line, which is a shame, as that’s adding good value. I guess I’ll run my subscription down till at least the 7th delivery to see all the free gifts come, as why not. Though that’s still £184 Of magazines by then, so why not go the whole way once I’m that invested.. I also grabbed some more of issue 1 for the extra paints, and I suppose models, from the newsstand website. £7 for 3x issue 1 wasn’t bad. "Is any of the content in this collection new? Games Workshop have created a brand-new Space Marine army for this collection. The Silver Templars will have their own unique colour schemes, armour markings and history which will be developed and expanded with each new issue. There is also an exclusive new miniature included with Issue 05." Yeah there’s a picture of him on here somewhere, those that got the trial had a picture at the back of issue 4. He’s probably in that tiny scale whole army view somewhere - quality isn’t great to look though. Also to add to what I was saying before, those of us getting free issues are really only saving £6 when subscribing, as issues 1 & 2 were £6, issue 3 was free in delivery two (3-6 for £24). Still it’s good to get something! Ooh, I like him. Nifty. Wonder if the Silver Templars will match the Silver Skills or Doom Eagles for ease of painting. I just don’t know what to do with several of the models I don’t want, just use to paint up for fun (like I need off topic things to paint from my armies). Plague marines I’m all set for my DG, now once we get to some of the stuff in that picture, then we will be fine..
Primaris I have none, but this is in effect a 5th 40k army for me if so..
My study is already full and I’m not sure my wife will let me spill out of there with models..
Oh the dilemma of wanting to collect things..
GW sent out a newsletter with details of Conquest, they do accidentally refer to it as a new monthly magazine though. For those subscribing online, the first parcel will only contain 2 issues and the modelling kit. Subsequent deliveries will contain 4 issues. Yeah, I'd happily buy the unique Lieutenant and maybe the Primaris Chaplain & Apothecary at 8 quid each, but those issues are likely to vanish rapidly especially if the places doing singles don't limit purchases per-customer(and in a way that can't be easily circumvented, like payment method and address, rather than just per-transaction) once the scalperscum get wind of this. Hopefully I remember to keep checking and get one ordered in time. Forbidden Planet have pre orders for the first 12 issues now. Do they ship to Europe? If not, I'm sure someone could stick an order in for you and forward it. I'll do it myself if you're stuck, although I'm still pretty new here so understand if you want a more established member to grab it for you. Instead of a folders for the first delivery you get a modelling set (glue and clippers). That seems like a much better incentive. The mug and art book have disappeared and a brush set has been added. Seems better overall although the poster is a bit naff. Surprised there is no primer involved. Are they proposing people pant straight onto the plastic? The previous easy build revell 40k kits did indeed suggest you paint into bare plastic, the idea was to use the paint for colour details, like black bolters etc Fact they've used coloured plastic suggests that's the case this time. Even so if the big picture is accurate I think this is an ambitious product and the fact they've got even one exclusive suggests they think it's going to sell. As a heads up, I got the promised e-mail for trial run subscribers today about updating payment information, but was unable to link my subscription to my online account. I phoned customer services and they said that this wouldn't actually be possible until the 29th when the magazine goes on sale. So figured this might save some of you a few minutes and a phone call (unless customer services were incorrect). Ah thanks for that. I was having the same issue and sent them an email. Annoyingly I got that email after having opened out another subscription. Obviously I only want the one, are they now going to try and send me two? I am very confused. Thanks for the heads up on forbidden planet- i just preordered a couple of the first few issues and the Lieutenant issue. Looks like a really good spread of models, will definitely dip in now an then for an issue. Forbidden planet have just posted my copies of the first issue. Cheers Tavis, was literally about to ring and thought I would just check here first to see what people were saying. I hope that doesn’t mean we get ours late though? Shouldn’t as our first delivery is free anyway..
You will only pay once unless you link your original one to a set of bank details. But the one you are paying for will be standard not with the first one free (that’s for existing subscribers, which you are now not). I would ring and explain/cancel the new one you just took out. Did you not get the email last week saying you’d get free bits for being loyal, and that an email (this one) will follow with how to set up payment details again? 2 emails total, to get all the info we needed to resub. I'm of two minds about this! On the one hand it gives some paints and tools and guides and might mean that I finally get some actual painting done on models that I don't actually "need/want" for my armies (thus mistakes are not an issue). On the other its still a decent chunk of money each month and I don't "need" the stuff as such.